We cover the most prestigious areas of London, those which detain a unique world class appeal and able to generate medium and long-term high returns: Mayfair, Knightsbridge, Belgravia, Chelsea, Kensington, Notting Hill, St John’s Wood, Hampstead and many others. For further information about our services, please call us on +44 (0)20 7373 5120 or email us at info@domus-london.com. By Appointment Only. Among the London neighbourhoods, Notting Hill is one of those which dramatically changed its nature in the last decade. From being an alternative and bohemian area, it has now become a trendy and expensive residential location with a strong international appeal. It is well known for its numerous restaurants, bars, little traditional shops and for the picturesque Portobello Road Market and the Carnival held at the end of August. Notting Hill features many squares with private gardens and it is very well connected with the other areas of London. Here you will find a good selection of interesting residential opportunities able to satisfy different budgets. Hampstead is a luxury neighbourhood on the northern side of the city and plunged into wonderful parks. Thanks to Hampstead Heat, one of the largest parks in London, Hampstead is one of the most sought after residential areas by those international buyers looking for a quiet and very prestigious house. Kensington is positioned on the western side of Hyde Park and host numerous embassies, consulates and some of the most sought after mansions. Compared to the nearby Notting Hill (North) and Knightsbridge (South), Kensington is quieter and less touristic, still being just a short walk distance from the more commercial spots like Harrods. Located next to Hyde Park, Knightsbridge is a very prestigious area hosting Harrods, the famous shopping temple, the theatre Royal Albert Hall and the new residential address One Hyde Park, known to be the most expensive residential development in the world. Despite its undisputed touristic appeal, Knightsbridge features also a number of quiet streets with luxury residences. Knightsbridge is therefore an area which is able to offer an excellent mix of shopping opportunities, restaurants and elegant properties overlooking wonderful private gardens. 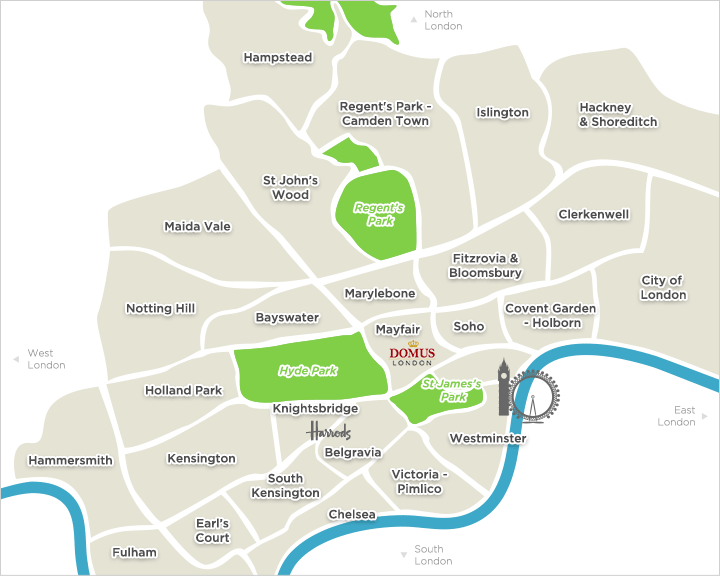 Bayswater is a neighbourhood offering a perfect mix of different styles and properties. Here you will find small hostels, student accommodations, but also luxury residential developments and hotels. The area is well known to host a wide selection of international restaurants: Indian, Chinese, Greek, Arabic and many others. Bayswater is positioned on the northern side of Hyde Park and boarders Notting Hill. The area is very well connected to the more commercial spots of London: Piccadilly, Oxford Street and Regent Street. Belgravia is the institutional area of London, hosting a large number of embassies and some of the most elegant and traditional properties. In this area it is not easy to find flats and apartments, rather the neighbourhood futures large and very prestigious single family dwellings. Streets are wide and surrounded by elegant gardens. The most sought after addresses are Eaton Square, Belgrave Square e Cadogan Square. Belgravia borders Knightsbridge on the North, South Kensington on the West, Chelsea on the South and Victoria on the East. Westminster is the London area with the highest number of touristic attractions: Buckingham Palace, the London Eye, the Big Ben, the Parliament and the Westminster Abbey. Despite being a highly touristic area, Westminster is also able to offer very quiet streets and squares and it is often the residential choice of politicians and diplomats. This area, which takes the name from the old railway station, has improved a lot in the last years and it is now a perfect mix of tourism, commerce, restaurants, cinemas and private residences. Despite its very central position and the excellent transports, residential prices are lower than in the surrounding areas of Chelsea, Belgravia and Westminster. Here it is possible to find both period and newly developed apartments. This neighbourhood is much sought after by buyers looking for an area which perfectly maintained its original character. The area borders Notting Hill and takes its name from the beautiful and quiet nearby park. This residential neighbourhood features beautiful greenery and picturesque single family dwellings. Its most well know part is Little Venice, so called due to its beautiful canals which are navigable by small boats. Maida Vale is also known by Londoners to be the host of the BBC headquarter. St. John’s Wood is a residential area on the northern side of the centre and boasts numerous single family dwellings surrounded by trees. The most prestigious properties are those overlooking the prestigious Regent’s Park. This neighbourhood is much sought after by buyers looking for a quiet residential area not far from the centre. Earl’s Court is considered the younger sister of South Kensington featuring a very similar architecture and a cosy atmosphere, but being cheaper than South Kensington. The area boasts a multitude of private gardens, parks, little shops and restaurants and it is very well connected with the centre of the city and just a few minutes’ walk from Hyde Park. South Kensington is a residential area loved by those investors looking for a green and well-connected location. South Kensington offers an excellent cosy atmosphere and here are some of the most interesting London museums like the Natural History Museum and the Science Museum. The area is also well known to host the prestigious Imperial College of London and the Lycee Francois de Gaulle. Originally a little medieval village, Marylebone has later become a luxury aristocratic area with many shops and restaurants. The main spots are Regent’s Park, Marylebone High Street e Baker Street. The area is well known also to host the Madame Tussauds wax museum and the best private clinics in London in Harley Street. This residential neighbourhood is named after the famous garden-park nearby. Regent’s Park is without any doubts one of the most beautiful London parks, always very well-groomed in detail. Properties here are usually elegant and sumptuous, boasting high ceilings, stucco and, the most prestigious, also view over the park. The area benefits from the surrounding greenery and it is just a few steps far away from the more commercial Marylebone. Originally a small fishing village, Chelsea has now become one of the most expensive and sought after residential neighbours of London. Chelsea is often the choice of international investors looking for a perfect mix between elegant period buildings and a modern and dynamic lifestyle. The area offers a wide choice of restaurants, clubs, shops, still maintaining its purely residential character. Here are located the well-known King’s Road, Sloane Square and Sloane Street which host the best international designers’ boutiques. Situated between Hyde Park, Piccadilly, Oxford Street and Regent Street, Mayfair is the most central area of London and one of the most prestigious and expensive of the city. Here are located world famous hotels, restaurants and the main international investment funds. The well-known Berkeley Square and the shopping streets of Regent Street, New Bond Street and Old Bond Street are among the most prestigious addresses of this neighbour. But Mayfair is not just shopping and investment firms, it is also a very sought after residential area, characterised by luxury and rarely available Victorian style properties. Islington is a district in Greater London and part of the London Borough of Islington. It is a mainly residential district of Inner London, extending from Islington High Street to Highbury Fields. Shoreditch has, since around 1996, become a popular and fashionable part of London. Often conflated with neighbouring Hoxton, the area has been subject to considerable gentrification in the past twenty years, with accompanying rises in land and property prices. Fitzrovia & Bloomsbury is an area of the London Borough of Camden, in central London, between Euston Road and Holborn, developed by the Russell family in the 17th and 18th centuries into a fashionable residential area. Soho is an area of the City of Westminster and is part of London’s West End. Since the 1980s, the area has undergone considerable gentrification. It is now predominantly a fashionable district of upmarket restaurants and media offices. Is the area around St. James’s Park, which is a 23 hectares park in the City of Westminster, central London. The park is bounded by Buckingham Palace to the west, The Mall to the north, Horse Guards to the east, and Birdcage Walk to the south. In the early 21st century, Holborn has become the site of new offices and hotels. Clerkenwell is an area of central London in the London Borough of Islington. South Clerkenwell became a fashionable place of residence. Hammersmith is a London borough in West London, and forms part of Inner London. Many international corporations have offices in the borough. Fulham is a London borough in West London, and forms part of Inner London. Many international corporations have offices in the borough.